Can be used with Traffic Cones / Spring Post for Barracading Purpose. Color - Available in Yellow / Green / Red. - Colour White, Red and Yellow. - Length Available in running mtr. 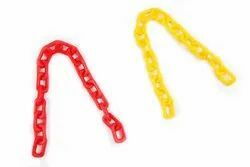 We hold huge expertise in offering Plastic Link Chains, which can be customize as per the demands of customers in proficient manner. 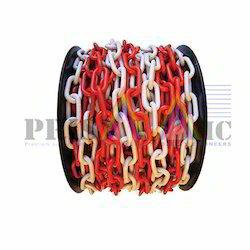 PVC chain links offered by us are also known by the names of rhombic mesh, diamond mesh or chain link fence. These chain link fence come in finely woven diamond pattern and feature strong, durable & flexible construction. The closely spaced diamond mesh construction also provides the fence linear strength as well as springy texture.